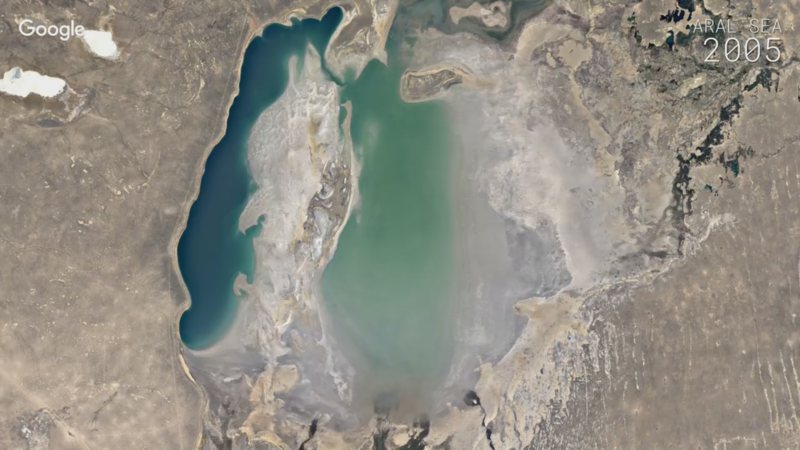 Google Earth's time-lapse videos show see how the planet's surface has changed over time — like the evaporation of the Aral Sea (above). Google Earth's time lapse videos of earth's landscape could make you think about the great baseball player Yogi Berra. "I thought about one of the quotes attributed to Yogi Berra," says Marc Levy, a political scientist at Columbia University's Earth Institute who specializes in issues of global health and development. "He said, 'You can observe a lot just by watching.'" To show just how much the Earth's landscape has changed over the past three decades, Google sifted through 5 million satellite images containing three quadrillion pixels. The result is a series of high-resolution, zoomable time-lapse videos that capture, in unprecedented detail, the human impact on this planet. By collapsing 33 years of satellite imagery into three or four second clips, Google Earth's time-lapse videos give us a "very tangible sense of how large changes can unfold quickly," Levy says. Hover over Dubai, for example, and you'll see the desert transform into a metropolis. "And you can see the steady expansion of the city into the ocean," says Levy, who has advised the United Arab Emirates on how to develop its cities without hurting the environment. "You can see how they build, they build, they build," he says. "It's a monument to human drive and determination. But all those expansions have come at the cost of coral reefs and marine species." Similarly, a time-lapse of the Chonqing municipality in central China shows new cities and suburbs popping up over a matter of months. Elsewhere, you can see the stark impact of climate change — drought and deforestation. One video shows the Aral Sea evaporate away. "It shows how fast something important can be ruined," Levy says. When Google first launched this time-lapse feature in 2013, it was built using low-grade images that gave a broad sense of how the Earth was changing. Now, thanks to higher quality imagery from NASA, we can see minute details — including the appearance of new roads and buildings. And yet, there's a limit to what such videos can teach us, Levy says. "There's a lot of stuff that you cannot see that's really frightening," he explains. Pollution, for example, and the spread of disease. "And if you had an infrared view, you'd see the warming of the planet," he adds. The other drawback that Levy sees: The videos might make a person think that human development and climate change is happening on such a massive scale that individual communities can't do anything about it. That's just not true, Lexy says. So if you're going to watch these videos, here's something to remember: "Each little pixel is a community."